On Monday 6 May 2019 from 18h00 to 21h00. On Monday 7 January 2019 from 18h00 to 21h00. On Saturday 10 November 2018 from 10h00 to 13h00. On Monday 5 November 2018 from 18h00 to 21h00. On Monday 1 October 2018 from 18h00 to 21h00. On Monday 3 September 2018 from 18h00 to 21h00. On Wednesday 13 June 2018 from 18h00 to 23h00. On Saturday 17 February 2018 from 08h00 to 15h00. On Saturday 28 October 2017 from 18h30 to 20h30. On Friday 2 December 2016 from 18h30 to 23h00. On Saturday 26 November 2016 from 10h00 to 17h30. Grenoble Atelier Framaboard : un outil pour s’organiser ! On Friday 20 May 2016 from 12h30 to 14h00. On Tuesday 22 March 2016 from 14h00 to 16h00. From Saturday 12 September 2015 at 10h00 to Sunday 13 September 2015 at 18h00. On Wednesday 25 March 2015 from 15h00 to 17h00. On Saturday 7 March 2015 from 16h00 to 17h30. On Sunday 26 May 2013 from 20h30 to 23h30. On Saturday 18 May 2013 from 16h30 to 19h30. 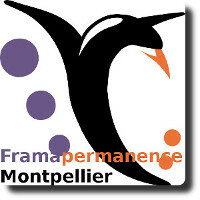 Limoges MDLL 2012 : Conférence "Framabook, le pari du livre libre"
On Saturday 24 March 2012 from 14h00 to 16h00. On Wednesday 19 March 2008 from 18h00 to 23h00.